18V ONE+™ HYBRID LED PROJECT LIGHT is rated 4.9 out of 5 by 12. Rated 5 out of 5 by juanders from Amazingly Bright I am amazed with how far LED technology has come. 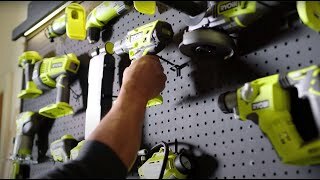 Every time Ryobi comes out with a new LED light it just keeps getting brighter and brighter. Forget about LED technology as well, this is one of the brightest lights I have ever seen. With its compact size and swivel movements you can get the light exactly where it is needed. 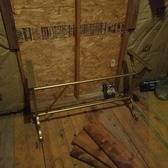 I had an electrician at my house over the weekend doing work on my electrical panel in the basement, which of course means no lights. I was more than happy to bring this light out and light up his entire work space. Boy was he happy. Even outside of home projects, I plan on taking camping and other outdoor activities to light up the night. Rated 5 out of 5 by DrewBHAM from This light is Great! I just got this Project Light and I am so happy I did, it’s Great. The Project Light is build well and looks like the engineers at Ryobi spent some time thinking this light out and not just threw something together to get to market. This light it small and well balanced along with easier to carry due to the grip area around the base that is recessed and rubber covered. One really nice thing they did was make the locking hook in the top have a metal lock point under the plastic shell so the hook should lock and unlock easily and not get worn out over time. There is also a small lanyard attachment point at the rear of the light below the LED panel and it looks beefy so it should work well as another way to carry and attach the light. The light is very bright for a small light, the medium light setting is not that much lower than the high setting. The 3 power setting also save battery life and allow you dim the light when you’re working close up to the light. The hybrid feature of the light is nice if you want to use the light for extended periods or if you want to use it without the battery or even if you needed to use the battery in a tool and still use the light. 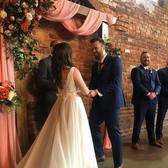 I don't think battery life is going to be much of a problem for most people and you still could use the light settings to conserve battery life if you wanted to. 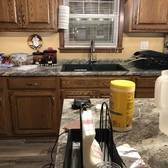 The LED panel turns to the left and right up to about a ninety degree angle to the front of the base but not all the way around and the LED panel also lies flat to the front and flat to the back of the base and anywhere in-between that for a lot of range of motion. This Project Light was really what I was hoping for when I bought the Ryobi P727 Workbench Light, but the Workbench Light was too big and cumbersome. I can’t wait to use it more and in more applications. Rated 5 out of 5 by jrbrown923 from Incredible little light! This light is so compact yet so bright! The clip attachment at the top makes it great for getting under the hood of your vehicle and the 3 brightness options make it easy to adjust to the environment you're working in. With a large battery you can work for hours without worrying about it cutting off on you. 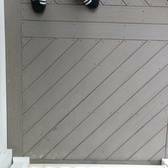 The slim design allows you to easily get to places that are super dark like under you house or outside once the sun goes down. From fixing the plumbing to night fishing, this little light does it all! 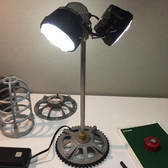 Rated 5 out of 5 by Luke thompson from Project light I never really knew how Convenient and effective tools like this could be until I got one. This tool gives off an impressive amount of light and works both with the 18 V batteries and an extension cord plug this feature came in han convenient and affective to lose like this could be until I got one. This light Gives off an impressive spread which comes in very handy painting, or working in tight places. I highly recommend this product in my opinion this is one of the most Convenient tools one could use. Rated 5 out of 5 by Tifftastic from You light up my life!!!! I just got this light a week ago and I am in love with it! There are three modes of lighting and it completely brightens my space. The first mode is so bright, it can fill a whole room. I also love how you can bend it in any direction that you need it to go. You can also take the loop and turn it into a hook to hang it on any surface that you need. There is also a plug in the bottom of the lights to plug in an extension cord. I think this is a must have in every workspace !! 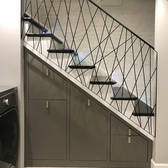 Rated 5 out of 5 by daustin from Perfect Project Light There is nothing worse then working on a project or in a tight space that you cant get good light! Well this SOLVES all of that. This light is nothing short of amazing!!! it rotates around to face any direction, you can hang it with the flip out loop at the top...and did i mention that it has a magnate on it just the the drills!!! and the last thing that is AWESOME...is its a hybrid..and that means you can plug this lil-guy into the wall for all day power!!! So amazing!!!! 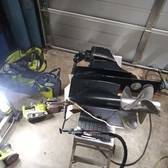 Rated 5 out of 5 by David G from STURDY, VERSATILE, BRIGHT PROJECT LIGHT Ryobi was obviously at the top of their game when designing the 18V Hybrid LED Project Light! It’s sturdy, versatile and puts out a large area of bright, even light. The head can be adjusted vertically and horizontally and there’s a sturdy hook in case you want to suspend it. I’ve used it to illuminate a workbench and shone it on one of my wife’s quilts hanging on a wall. The clear white light provided by 18 separate LEDs has 3 different levels of brightness. The lowest can be used to read a book while the brightest is ideal for project work. I like the fact that it can be powered by either a Ryobi 18V ONE+ lithium battery or an AC extension cord. Ryobi claims that the battery will last 35 hours on low light level mode although I haven’t tested that. It sounds ideal as a backup light during power outages! This light meets or exceeds my requirements in every way and I highly recommend it to anyone who’s looking for a bright, versatile, sturdy work light. Rated 5 out of 5 by Burnt Chicken from Very bright! I bought this because I am sick of replacing batteries in my other lights. 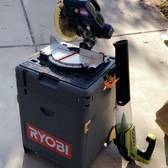 I have several other 18v Ryobi tools, so i figured I would try it out. It's very bright; I almost never use the high setting. On medium or low setting, battery life is very good with a 3AH battery. The hanging hook is handy too. 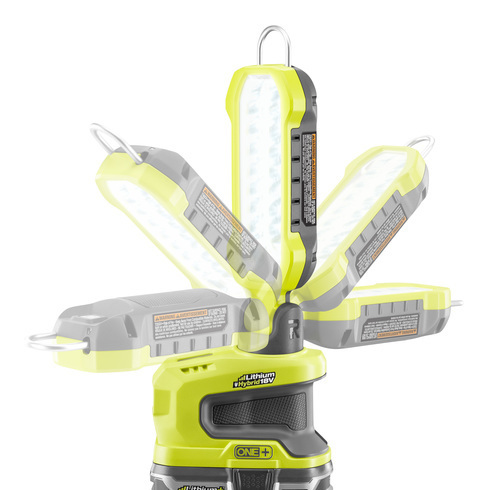 RYOBI introduces the new 18V ONE+ Hybrid LED Project Light. Find it in the Electrical Aisle at The Home Depot. Light up you workspace with three modes of light output, and 180 degrees of light rotation. The multi-point light-head and the locking hook adjust to adapt to various applications. 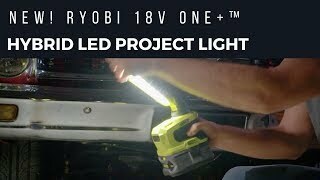 Best of all, the 18V ONE+ LED Project Light features HYBRID technology, giving you the ability to use it with any RYOBI ONE+ battery, or extension cord (not included).